For myself and a lot of Americans, Thanksgiving is a much bigger family holiday than Christmas. This sentiment was not noticed until I started living in England where there is obviously no real celebration of Thanksgiving. Christmas in the UK is the major holiday and the month of December is full of many parties leading up to the event. When working in the American corporate world, a week off of work is rare. Since I saw travel as an important life experience, I always used that week accordingly. Thanksgiving, however, is a long weekend meant for families. You spend the day cooking real food, relaxing with your biological or adoptive family and trying to remind yourself of all you have to be grateful for. Thanksgiving is the underdog. So much more wholesome than it’s greedy expensive sibling, Christmas. When you are living abroad, things shift. Sure the grocery stores stock American food items including cans of french fried onions for your green bean casserole and free range turkeys, but you don’t get the day off work and the people around you don’t understand the holiday in its entirety. 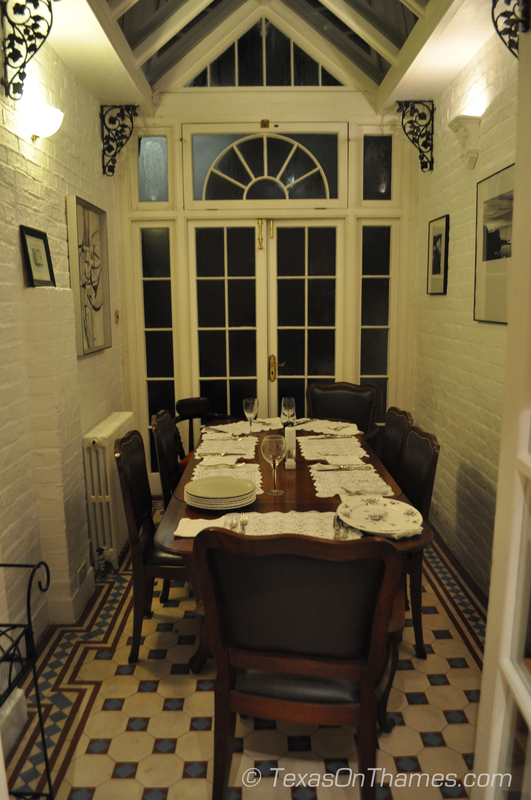 Last year in London I decided to host a Thanksgiving dinner at my home. I had a friend visiting from the US who had brought along a friend of hers and a few other American and non American friends to invite over. I envisioned a day full of cooking and sipping wine followed by lively conversation around the gorgeous dinner table in our conservatory. I spent time sourcing ingredients and pre-ordered my groceries online. And then things just fell apart. The girls staying with me had a massive fight the night before, leaving one of them missing until the next morning and when she did reappear they were not speaking. My groceries were late. Really late. Which left me late to put the turkey in. People’s schedules got delayed and I spent the day cooking alone with two house guests who were in a sour mood. And as the weather was changing, the nights getting longer, people were more and more fatigued. Dragging their bones from across London to my house after a long day of work to have a few bites of turkey and leave. So much preparation, and then it was over. The guests had given it their all, considering the situation. My expectations obviously needed to be adjusted. I had made sure there were plenty of leftovers to take home, but few obliged. As I don’t eat turkey, there were to be turkey sandwiches for my husband for weeks to come. “I tried to get a small one,” I reasoned. “Next year can we just get a small chicken or a ham?” he asked. “You’re lucky it wasn’t a tofurkey,” I answered. So this year, we have done a major oops. Without the constant reminder that it is around the corner, we have made other irreversible plans that do not involve traditional Thanksgiving activities. Maybe it will be better this way. We can celebrate the following Saturday. Gather together the few Americans we know across the island of Singapore and cook a turkey on our primitive gas fired camping stove that acts as our primary cooking device. Or perhaps its time to redefine Thanksgiving and make it work for us. Afterall, the Australians spend Christmas having a BBQ on the beach. Maybe we trade in the warm cider and oven baked turkey for corn on the cob and champagne. Adapt. New traditions are all in the making. Editor’s note: You’ll be happy to know that the primitive gas camping stove was eventually upgraded to a real stove complete with oven and burners. The Mustafa Center. Putting Walmart to Shame Since 1971. Oh no! They’ve closed the Singapore Carrefour! Both of them! Panic. Where am I going to get things? “Imagine not having a Walmart or a Target to go to,” I tell Leslie back in Texas. “Yeah, I could see how that would be annoying,” she says. It’s not that either of us like or philosophically support Walmart, it’s just that sometimes it becomes a necessary evil. “Can’t you order things online?” Leslie asks. “Can you Yelp it?” she suggests. “Nope no Yelp either,” I answer. Hopefully someone more business-minded and less lazy than myself will see this as an opportunity. But alas, this may be an overreaction. Afterall, there’s always the Mustafa Center. In the heart of little India and open 24 hours, it’s 75,000sq ft of random and not so random items, a hotel, café and supermarket. It is the place to go to buy tomato soap, an engagement ring, an ipad and an eye massager all at 2 am on a Tuesday, emerging three days later after a sensory overload induced psychosis has finally run its course. That’s right, I said tomato soap, not soup. 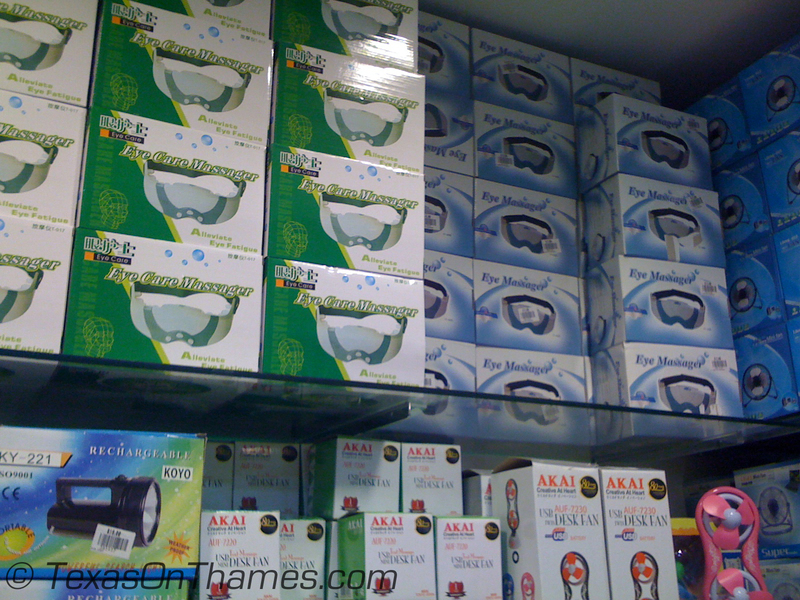 And yes, an eye massager as well. Eye massager. Multiple varieties available. In the spirit of Diwali, maybe I’ll head down to little India. Since I’m there anyway, perhaps I’ll pick up a curry, some aspirin and a new laser printer. If I’m not back by Friday, send a search party out. 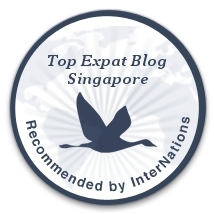 Editor’s note: Yelp has answered my plea! Or maybe I was mistaken in the past. Seems like some Singapore places are rated on the site. It’s a start. The first time I saw this, I giggled. Seriously? 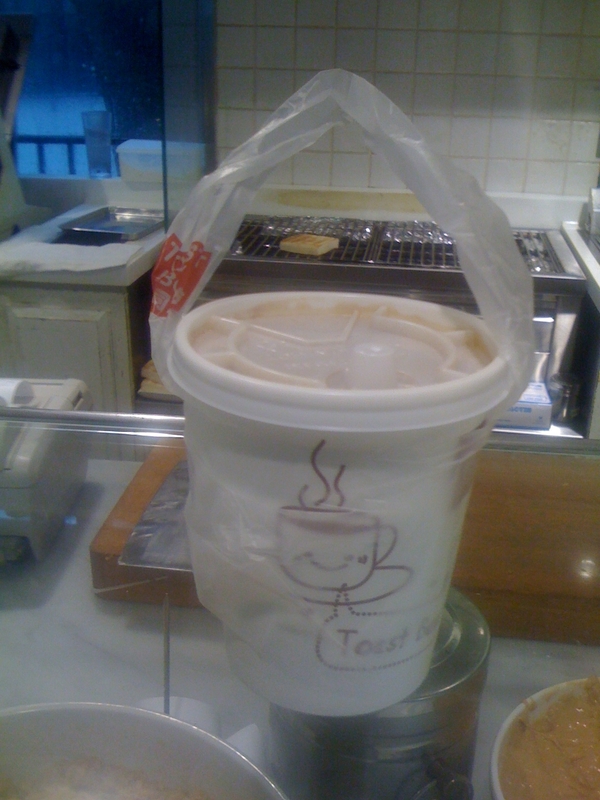 You have added a plastic piece to turn my beverage into a carrying case? 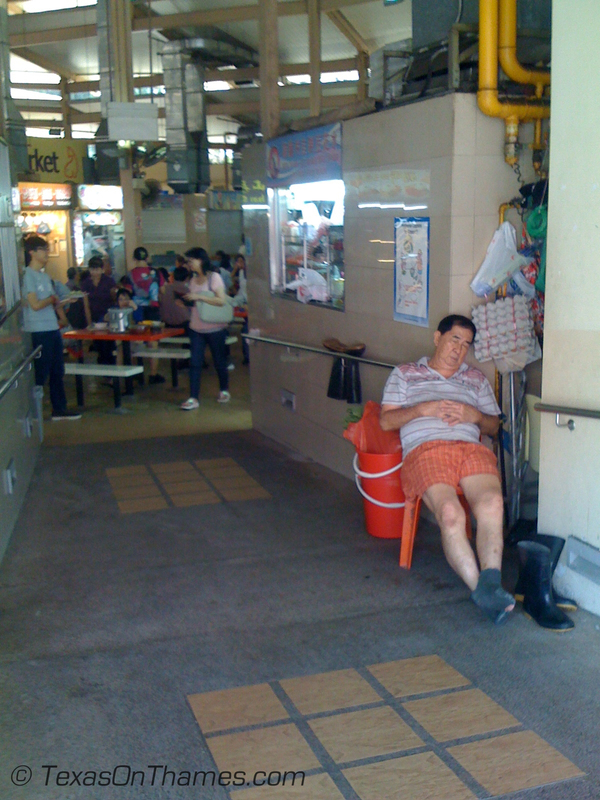 They do this almost everywhere in Singapore. You order a juice, a coffee, from just about everywhere unless it’s an American chain and you get this flimsy appendage as a bonus. Because it’s too difficult to carry a cup? “Hey don’t knock it until you’ve tried it,” my inner voice tells me. I tried to order my coffee without it once, but I’m not sure what it’s called and the lady behind the counter didn’t understand me and just thought I was weird. I’ve progressed. I now ignore it instead of immediately ripping it off, but it still just seems like extra trash destined for a landfill to me. I’ve never had things not made for me. The original plans in the engineering building at my university did not call for a women’s bathroom. The school compensated by converting the one on the first floor into a ladies room, much to the chagrin of the men. And the entire thing about being a female engineer is really a bit abnormal in the first place. Then there was that period of time- my entire teenage years- when I was too tall and skinny to fit into normal jeans or trousers. Everything was just a few inches too short leaving my socks showing and submitting me to high school mean girls shouting “There’s a flood!” when I turned the corner. Although the bully experience was scarring, you don’t get much sympathy for being too tall and skinny. And then I gave up eating meat, so there was that. But I lived in Austin, and then London so that wasn’t too much of a problem. But mostly I fit in. I’m right handed. I’ve never had a disability, unless you count being severely clumsy. Then I moved to Singapore where my average height self and husband stand up tall over the rest and not eating meat is something the Hindus do, not the ang mohs. But the daily struggle is the clothes and the beauty products. My friends back home were shocked to hear that in Singapore I was an XL. Sure you can get the same high street items as you get anywhere like Gap and Zara, but they aren’t guaranteed to stock your size. For the record, I’m not overweight. And the beauty products are to lighten skin and smooth the hair, while I already get pretty pasty and have hair so smooth and flat that it will hardly hold in a ponytail. The sales ladies don’t understand and in their aggressive nature proceed to tell me how their smoothing serum is great for Caucasion hair. “But lady, look at it. It doesn’t need to be any straighter. It’s already limp and lifeless,” I try to reason with them. They can’t seem to answer my question as to why the skin product they are pushing is allegedly good for Caucasians. I then realize I am only being placed in one category: white. This is the portion of the post where I apologize to all my black female friends and acquaintances whom I did not take seriously enough about their hair and beauty product struggles. Obviously my problems are not the same, and yet I still feel traumatized. I’m made to feel racist when I request a hair stylist who can deal with REALLY fine and thin hair. “All of our stylists our good with Caucasion hair.” That’s not what I was asking, and by the way I ask this question at all new salons. That includes in the US and Europe. So really, please don’t take offense! These are first world problems, I know, but you don’t mess with a girl’s hair. My last haircut left me feeling pretty sad. At the end of the haircut, I had to ask for more product. And more product. “My hair is so fine it’s falling in my eyes,” I had to point out. “Oh sorry,” she said. “Most Singaporean girls don’t wear product in their hair.” I tried to smile, but couldn’t help but think about how I had just paid her $70 to teach her how to cut my hair. I know there must be very talented hair stylists in Singapore, I just have to learn where to look. I walked straight out of the salon- one I found on expat forums miscategorized as cool and chic and good with fine hair mind you- and straight into a plate of cheese fries. If you are going to engage in emotional eating, might as well do it full force. I guess I should be grateful that there are some things you can get everywhere. Texas style, with a side of ranch. Author’s note: In case you are desperate for a reminder of home, there’s a Chili’s at Tanglin mall and Clarke Quay in Singapore. Normally I wouldn’t condone this behavior, but hey, there’s really no shame in it from time to time. 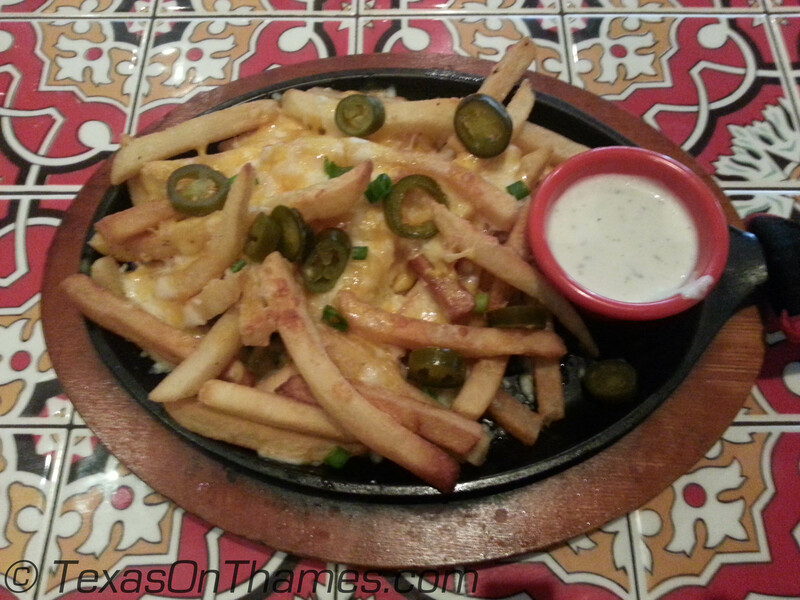 I know a foodie friend who once drove 2 hours in the UK just to go to a TGIFriday’s. Think about how desperate he must’ve been.